Amaq News Agency is a news outlet that, according to The New York Times and experts, functions much like an official part of the ISIL media apparatus – though ISIL does not acknowledge it as such. Amaq's statements are typically released to the mainstream media by the SITE Intelligence Group in Washington, which sometimes translates them into English. Experts like Charlie Winter of the Transcultural Conflict and Violence Initiative at Georgia State and Rita Katz of SITE Intelligence Group in Washington confirm that Amaq is assimilated into the ISIL’s propaganda structures and "are behaving like a state media". Observers have noticed a difference in language, style, neutrality and tone though between official Islamic State media and the reports of Amaq News Agency. 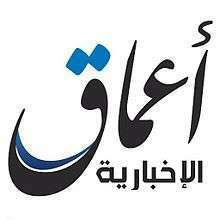 Amaq News Agency was established during the Siege of Kobanî in 2014 as an alternative to Western media coverage of the siege. It became more widely known after it began reporting what have been taken as claims of responsibility of terrorist attacks in Western countries, such as the 2015 San Bernardino attack. IS officially claimed responsibility the next day. It has featured embedded reporters at the scene of IS battles, including an Amaq cameraman who shot the first footage of the capture of Palmyra in 2015. Amaq has launched an official mobile app and has warned against unofficial versions that reportedly have been used to spy on its users. It also uses a Telegram account. 1 2 3 4 5 6 "A News Agency With Scoops Directly From ISIS, and a Veneer of Objectivity". The New York Times. 14 January 2016. Retrieved 5 August 2016. ↑ "Islamic State: Fake version of Isis Amaq news app is spying on its supporters". International Business Times. 2 June 2016.